Months of heated debate over whether to arm San Francisco police with Tasers came to a raucous conclusion late Friday night as the city’s Police Commission voted 4-3 to approve the stun guns. The meeting’s adjournment near midnight was met with thunderous cries of “shame, shame, shame,” from a crowd of several dozen that had been left out of the meeting room. Like a powder keg, the special Police Commission meeting only required the right spark to blow up — and it did so, several times. The vote was delayed for more than an hour after one activist refused to relinquish the mic during public comment, bringing the hearing to a standstill — albeit a rowdy one. Later, in a smaller room two floors up, commissioners endured relentless admonitions for abruptly shutting down and relocating the meeting. Though the oversight body gave the weapon the thumbs up, it ruled that it cannot be deployed until Dec. 2018, when new use-of-force policies will have been in effect for two years. Mazzucco was joined in the “aye” column by Mayor Ed Lee appointees Sonia Melara and Robert Hirsch, and Newsom pick Joe Marshall. 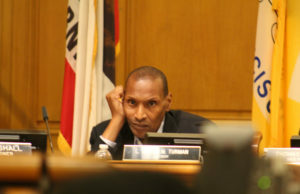 Opposing them were the three Board of Supervisors appointees: Commission president Julius Turman, Petra DeJesus and Bill Ong Hing. While none of the votes were a surprise, opponents had hoped to sway Hirsch. Instead, those in favor of Tasers managed to accommodate his view that more time was needed, by delaying the implementation of Tasers for more than a year. For the “no” contingent, a year’s delay was not enough. “We are in the middle of moving this process, moving this department in a more positive direction,” said Turman, who repeatedly lost his patience throughout the seven-hour meeting as he attempted to settle a disruptive, overwhelmingly anti-Taser crowd. He went on to say that use-of-force techniques are working within the force, and that use of force among SF officers has been declining. Public comment and the commissioners’ questions for experts were nearly drowned out, at times, by chanting from the hallway by attendees furious at the restrictions Turman placed on the latter half of the meeting. The president allowed the steady stream of attendees to continue speaking, but officers at the door of Room 400 admitted only five in at a time for their two-minute remarks at the microphone. The meeting’s resumption on the fourth floor — before a crowd of mostly journalists and cameras — came more than an hour after 67-year-old activist Maria Cristina Gutierrez refused to concede the lectern. Gutierrez was one of the Frisco 5, the group that staged a hunger strike in the Mission District last year that helped unseat Police Chief Greg Suhr. By the time another speaker took over for Gutierrez, the commissioners had retreated to a back room. An hour later, the halls of the top floor of City Hall rang with chants of “let us in!” and “show your face!” The new set-up didn’t sit well with Commissioner Petra DeJesus. DeJesus, on crutches and in a medical walking boot, left the new dais to join speakers waiting in the hall. Right before the vote, she slammed her colleagues for considering Tasers. “I think this commission has turned their deaf ears to the communities that are most affected by this,” she said. The overwhelmingly anti-Taser crowd added their disgust at the meeting shake-up to their pleading that commissioners reject the device. At one point Turman, visibly impatient since the intermission, let loose. “Do you think we don’t take this seriously?” he asked, lifting a hefty binder of Taser materials over his head. “I just need to hear the information and make a decision,” he said. In a now-common refrain for police higher-ups, Chief Bill Scott emphasized Tasers’ adoption would be accompanied by robust accountability measures and that his department prioritizes de-escalation tactics. “The reality is that there are times that de-escalation does not work, and officers have to use force as safely as possible,” he said at the meeting’s outset. Proponents argue Tasers are a less-lethal option for subduing a combative person, saving the lives of both suspects and officers. The swarm of attendees begged to differ, asserting that the stun guns are still lethal, especially for those on drugs or with certain medical conditions, and are used disproportionately against people of color. Critics pointed to studies showing some 50 percent of Taser deployments fail to make the targets comply. According to Mike Leonesio, a Taser consultant who established Oakland’s Taser program, the effectiveness of a newer model the department has its eye is still wholly unknown. “I have been searching and searching for more data to either confirm or deny the efficacy of these weapons, and there just isn’t any out there,” he told the commission. Another major sticking point has been the price tag: City budget officials put the cost of each device at $2,300. When other expenses are factored in — including defibrillators, device testing, Taser instructors, medical transports, data collection, and the risk of lawsuits — the cost balloons, to an estimated $2.8 million to $8 million in one-time costs. Sparking this most recent debate was a 400-page report handed down by the Department of Justice a year ago that picked apart SFPD’s policies and practices, and offered up 272 recommendations for reform. To “strongly consider deploying” Tasers was among them. Scott and his deputies have taken pains to remind residents that they’re working to implement the full spectrum of ways the feds think they could do better. This is a victory for the POA which has fought for taser use and also harassed Suzy Loftus, previous President and opponent of tasers, into resigning from the Commission. The POA remains the immediate stumbling block to police reform in SF.